I make pancakes almost every day here. My hubby (The Chef) showed me yesterday how to make dulce de leche right in the can. A can of condensed milk boiled right on top of the stove turns into ooey, gooey, scrumptiously delicious: caramel. Darling Chef boiled the four cans covered completely in water for about 2 1/2 hours. Make sure your cans are not dented. The cans will be under pressure and you shouldn’t take any chances. I let the can cool until the next morning. I wouldn’t open it before as you do not want a caramel explosion in your kitchen. That morning we opened the first can and it was caramel paradise! The second part of the recipe is the organic apples sauteed with butter and cinammon. You could use conventional apples if you prefer. It will still be very tasty. Apples, cinammon, and caramel first thing in the morning with a nice caffe’ latte. Could it get better than that? Cut two organic apples into thin chunks and sautee’ over medium heat in a small skillet in two tablespoons of butter. *(While the apples are cooking, you could prepare the pancake batter).The apples will soak up the butter immediately. Keep adding water to the skillet a tablespoon at a time until the apples are nice and tender. Sprinkle on some cinammon and add another pat of butter. Whisk all the dry ingredients first. Make a well in the middle of the dry ingredients and then stir in the wet ingredients. 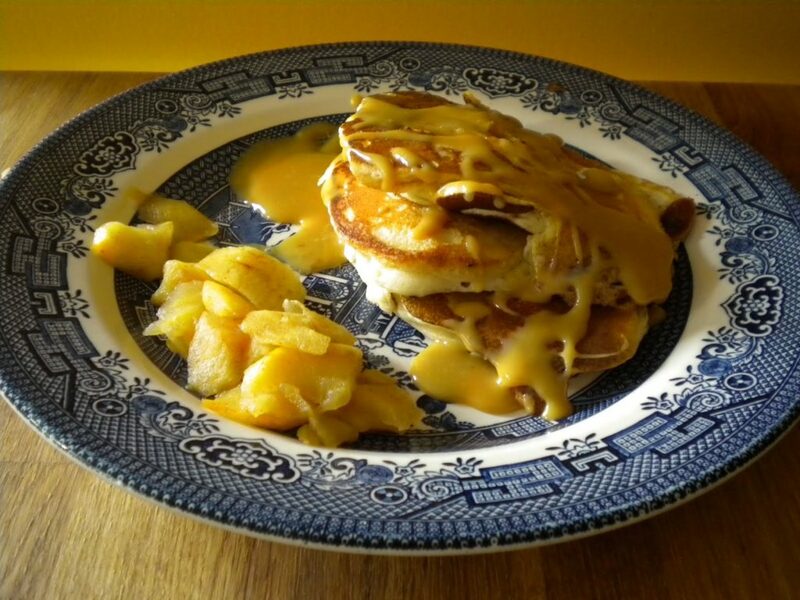 For these pancakes, I added a little bit of the sauteed apples to the batter. Let the batter sit for about ten minutes. Add a dab of butter to a pan that is on medium-low heat (you may need it on medium, depending on your stove). Once the dab of butter has melted, ladle out the pancakes onto the pan. You have to watch your pancakes. When you see the pancakes bubbling a little, it’s time to flip them. If it is too soon, it will stick to your spatula. You don’t want to rush them. Let the other side of the pancake cook for about 2 minutes. They should be a perfect, golden color. While the pancakes are being made, open a can of the condensed milk that you boiled the night before. Refrain from eating the entire can. Now plate up your gorgeous, fancy breakfast! Drizzle a little of the dulce de leche on top. A spoonful or two of the apples on the side. If you have an overactive sweet tooth, go ahead! Drizzle a little bit of maple syrup on top too!